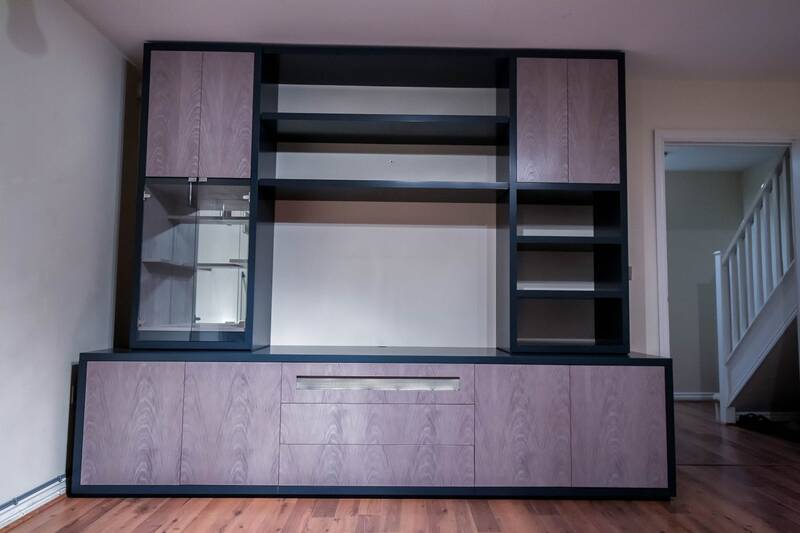 With the variety of TV and entertainment systems that take pride of place in our homes, having a bespoke TV Media Unit to store all your devices (and their unsightly cables), can result in an eye-catching, aesthetically pleasing piece of furniture, that gives a feel of luxury to your home. Waterhall Joinery have recently worked with a client to create a hand-crafted unit that would maximise their storage space to house their TV, Sky Box and DVD player, with the addition of a luxurious drinks cabinet being incorporated into the unit, thereby creating a decadent unit for complete entertaining. Charcoal grey in colour, with hand-veneered doors and drawer fronts in Tabu Dyed Grey Oak (Mundy Veneers), the drawers and doors were all ‘push to open’ to emphasise the pleasure of using all the Units facilities. A metal mesh grill was incorporated into a pull out drawer that housed the Sky Box and DVD to allow the use of the remotes whilst adding a contemporary industrial touch. 2 deep drawers were designed for the personal collection of DVDs and CDs, creating ample storage for all their favourites to be ready at hand and easy to select. 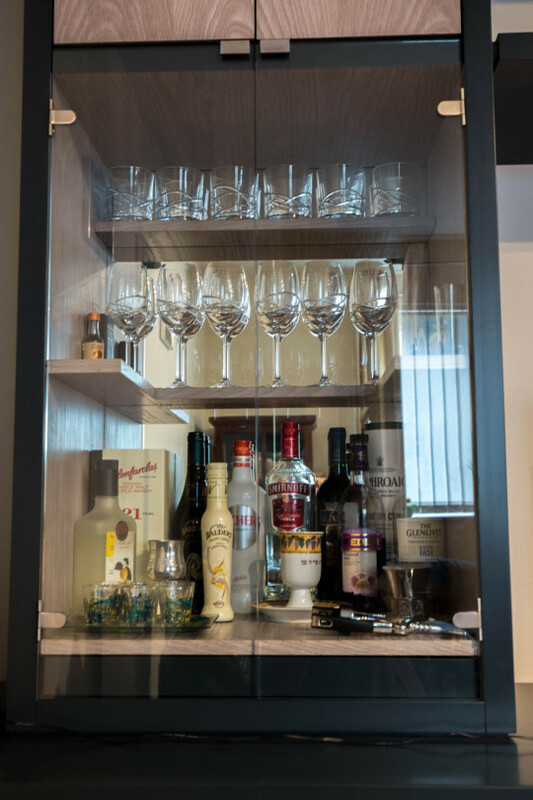 The drinks cabinet gleams with the hand veneered interior showcasing the collection of bottles and glasses, whilst the mirrored back provides additional backlight and gives the room the illusion depth. 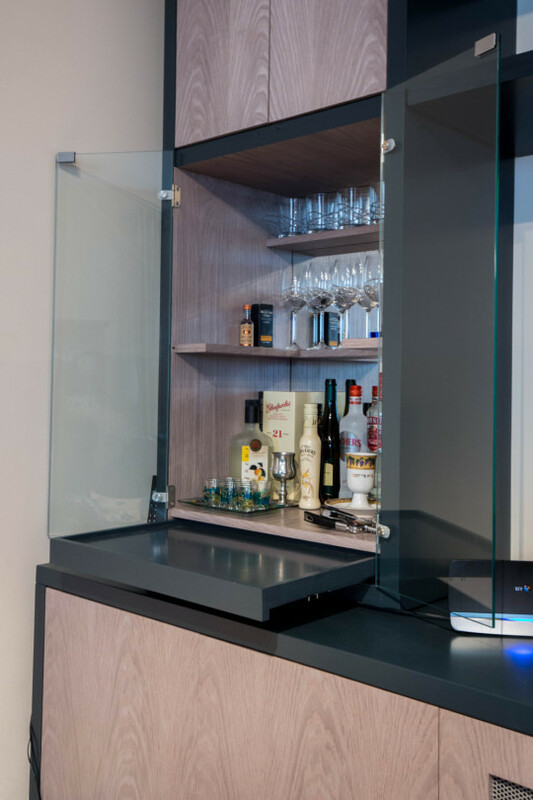 The final extravagance comes from the discreet push open tray, on which you can prepare drinks for you and your guests, whilst enjoying the many benefits of the TV Media Unit. For a unique Media Unit created for your home, why not contact us to discuss further the variety and options we can explore.